One of the things that you'll hear us talk about is the simplification and optimization of each line item in your budget. I have very optimistic outlook on life, but I still plan for different possibilities and I want to assure my family is safe even if something goes wrong. A critical piece of that planning–especially if you have people who depend on your income–is term life insurance. And if you are pursuing FI, you'll want the best price on life insurance you can find. I do not think that you need life insurance for your entire life, but you need it until you reach the point where your assets or the income from those assets are enough to support your family's life without you in the picture. There are different terms for these policies, often in the 10-30 year range, and where you are on your FI journey will determine the term length that’s right for your family. My general assumption is that someone just starting out on their FI journey would likely need a 20-year policy. If your family's living expenses are $40,000 a year, multiply that times 25 (the inverse of the 4% rule) and you would need one million dollars in investments to replace your income. The next step is to subtract your current net worth (your investments) from this calculated FI number and your life insurance will ideally replace all or most of this gap. So if you have $400,000 of net worth and a FI number of $1,000,000, it would be reasonable to consider a policy in the $600,000 range. Once you determine how much you need, how can you get the best rate? I've heard about a program that gave special rates to vegans marathoners and other people who are in incredible shape. I was looking into whether or not that would be the best bet for me. Then I heard about Policygenius. 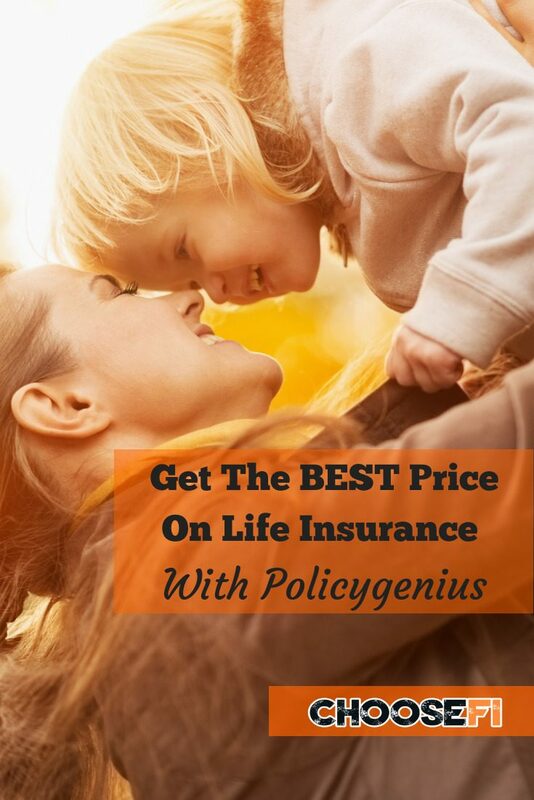 It shops hundreds of term life insurance providers to get you the best deal. It also doesn’t have any restrictions on who can use it. Brad hadn’t checked his quotes in a while so we decided to run a horse race between Policygenius and this special vegan marathoner program. Not only did Policygenius match this other company, it actually ended up beating them. That's when we knew this was the one. Brad ended up saving close to $700 in premiums and you could as well. Get your custom rates from Policygenius now. Policygenius gives you the perfect blend of flexibility and free market competition. That ensures you get the lowest price for your family. You can pick your coverage rate and it's very simple to come up with an estimate of how much you might need. 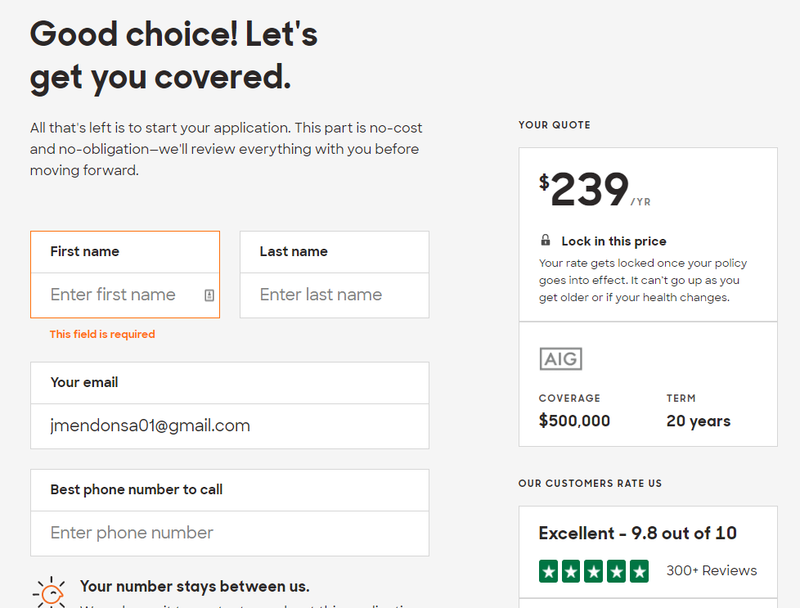 When you start on their homepage you’ll see a very simple intuitive interface where you’re prompted to select whatever number you decide for your coverage level and the term that you desire. You can see I chose a $500,000 policy with a 20 year term. 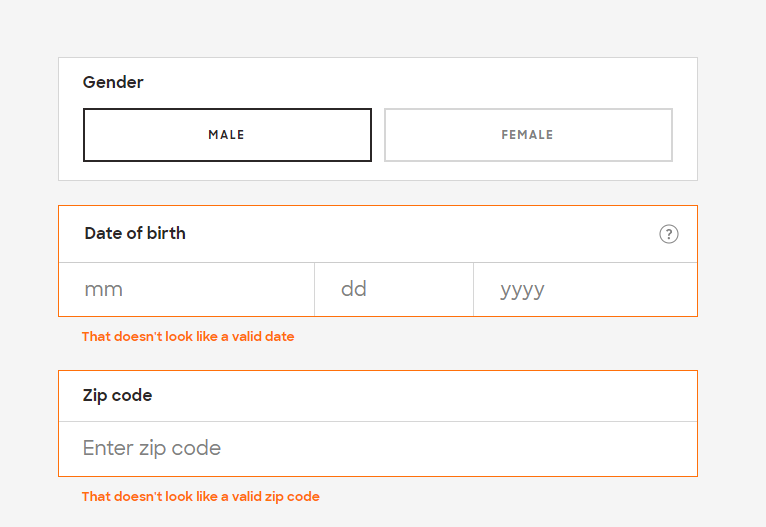 Specify gender male or female put in your date of birth and put in your zip code specify whether or not you are a U.S. citizen and then go to the next screen. The next screen is going to ask you for just some basic health details. 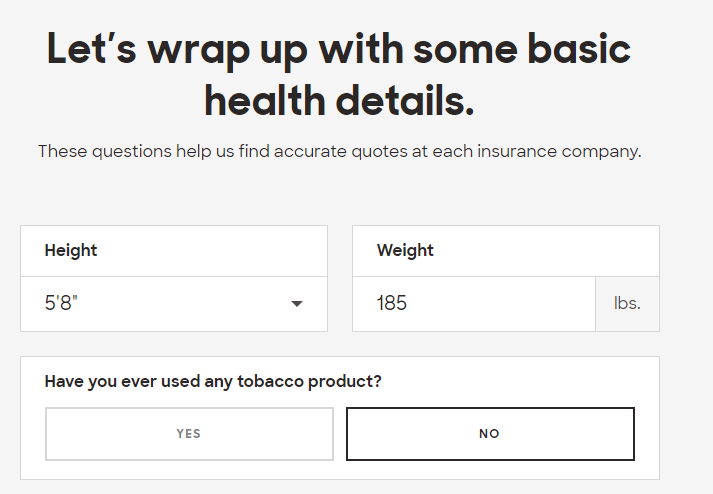 Questions like your height, weight, and tobacco use. 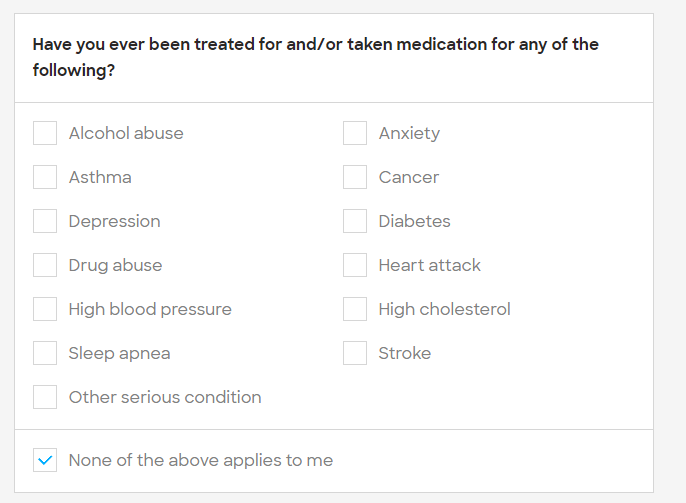 They will also ask you if you're on any medications. Just answer the questions there. It will gather information about any chronic health conditions and your family history. Term Life Insurance basically a bet. The bet is whether or not you are likely to die over the next 20 years; while that sounds kind of morbid, one of the reasons that term life insurance is so cheap is it is rather unlikely that you will ever need this. But it's such a low cost to you and not having coverage can be so financially damaging to your family if you are the income provider that it it absolutely worth it. Policygenius takes about 10-15 seconds to get you a full list of quotes. It will ask for your e-mail address to save the results. While you will get quotes from 10-20 companies they will separate out the top three most competitive quotes that came back for your convenience. If you are willing to pay on an annual basis you can get an additional discount on your pricing and this may change the top three choices. In this example, paying annually changed the numbers a little bit. AIG came in at two hundred thirty nine dollars a year. Quick, simple math on that shows you get it for 19.91 a month. That's amazing! Welcome to the future. This is the way to go about getting your life insurance. I hope this helps hope it saves you some money and gives your family the financial security they need until you get closer to your FI number. It's just a financial backstop for your family. This isn't necessarily something you're going to need for 20 years. They are committing to you that they're not going to raise their price on you for this period of time. They're not allowed to change the policy on you as you get older or if your health changes. So if you reach FI in 10 years or five years or whatever it may be you can always cancel the policy. You're not locked in but they are. And that is why I love this as just a back stop. A nice feature I noted is that after you select the company you are interested, they will share their aggregated user ratings for this company. This is crowd sourced feedback. It’s is nice to have those ratings right there on the dashboard before committing to an in-person call. Once you have made your decision based on your specific options it's going going to ask you for your phone number so you can get on a call with a representative from the selected company and you can lock down the policy. Input your first name, last name and best contact number and talk with an agent. Take action. Life insurance prices only go up as you age. This is the cheapest you will ever receive it. And you don't know what the future holds. If you discover you have a major health issue before you buy life insurance, that will significantly impact your rates or even your ability to receive coverage at all. Ask yourself if I were to die tomorrow or next year it would ruin my family's financial future? In my case, it would be very difficult for them to thrive if I were not around. That may not be the case in five or seven years, but term life insurance covers us for now. We can always reassess later. I don't like the idea of doing very complex insurance or bundling insurance with investments. I'm not a fan of whole life insurance, universal life insurance, or cash value insurance. I think the implied complexity, is lining the agent’s pocket with marginal benefit for the end user. But I think that a great low cost term policy absolutely makes sense for the individual that is aggressively pursuing financial independence. I hope you find Policygenius as useful as I did. Has there been one on auto insurance? I was wondering the same thing on auto / homeowner’s insurance, is there a company that stands out as being more affordable without skimping on the policy? I just got my quote–I’m about to save around $70/month. This works out to $8400 over the next 10 years! Incredible.